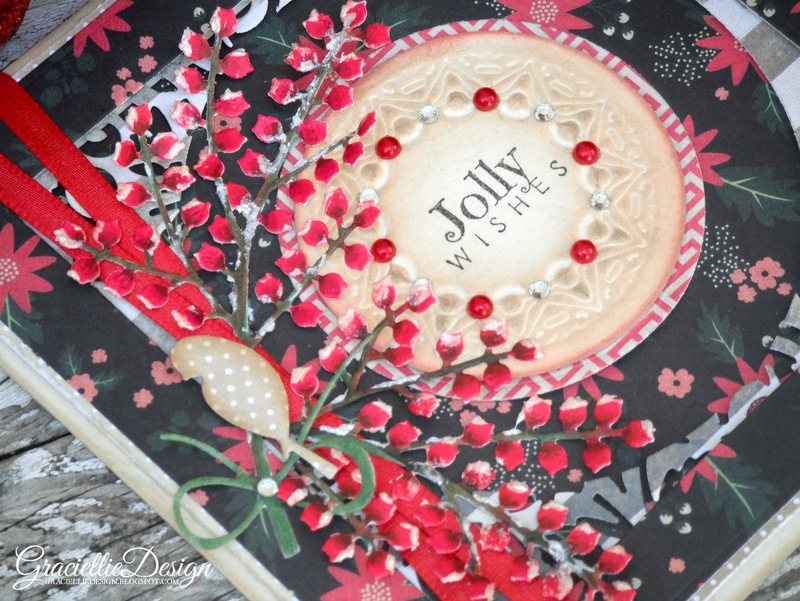 Snowy Winterberries & Jolly Wishes quick tutorial with unity stamp co.
I’ve always loved seeing die cuts covered in snowy textures, so I came up with an easy way to add snow to some pretty Holiday Winterberries. My Christmas cards never seem to have a traditional color combination and today’s card is no exception. I had to cut 4 different pieces to put together the final frame on this card… At one point I thought it was not going to work out, but most of the times I don’t give up on a project, I just make slight changes and suddenly the design starts to make sense. In this case the beautiful Burlap and Bouquets paper by Fancy Pants Designs made a big difference! I played with die cuts quite a bit for this card… The striped layer was cut with a Distressed Benson Corner die on opposite corners and that created a beautiful effect, letting the patterned paper show through. The central circle was embossed with a Gold Circles One die and that added a cool textured frame around the sentiment. I made a quick and easy tutorial for the -lovely- Holiday Winterberries. View my tutorial HERE. I would love it if you could click on the little heart on my guide’s cover! I finished up my card with a crisscrossed ribbon column, a Nestled Bird cut from patterned paper, pearls, rhinestones and a super cute Jolly Wishes stamp from my latest stamp kit by Unity Stamp Co. (view kit HERE). I hope you enjoyed today’s post and tutorial! Thanks for visiting. Love these gorgeous colors and this card arrangement! Wow! What a stunning card. I love the colors you used and the pretty winter berries. The little birdie really set off the spray and all the layers. Thanks for joining the weekly challenge at Classy Cards 'n Such, I have thoroughly enjoyed seeing all your cards and tutorials the last few months. So pretty! Beautiful Christmas card design Gracie, gorgeous die cuts and colours. Thank you for joining us over on Poppystamps blog. Your card is beautiful, Gracie. 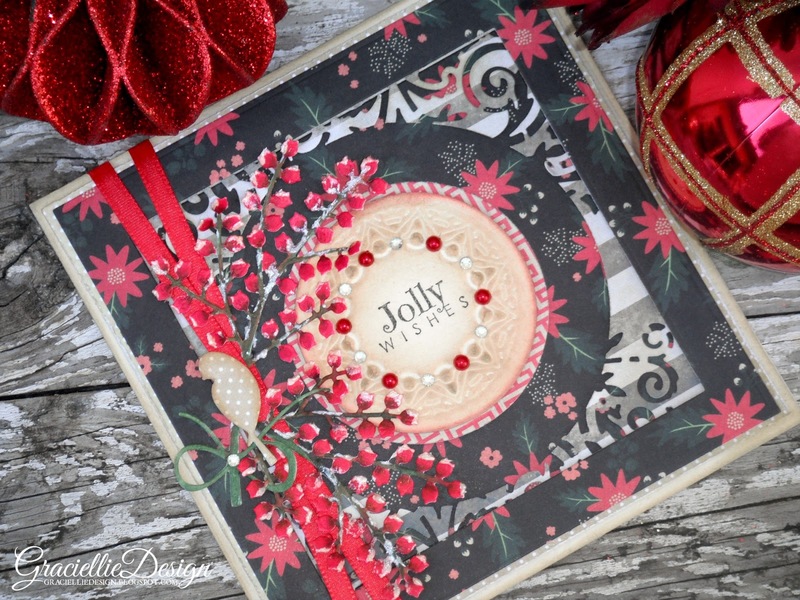 I love red, black and white color schemes for Christmas cards. Thank you for joining us for our challenge at Classy Cards N Such. So beautiful and elegant creation. Love the Winter berries. Beautiful and stunning card! Thank you for playing along in the Word Art Wednesday Challenge! Have a blessed day! Wow, Gracie, this is gorgeous! The colors are amazing too! Thanks for playing along with us over at Poppystamps! I am amazed by the beauty and intricacy of this card! The layering is simply gorgeous! What a gorgeous card! Love the layers. Thank you for inspiring us at Color My Heart Challenge Blog. This is amazing, Gracie. Thanks so much for playing along in our Christmas Challenge, and please join us again soon. Love the gorgeous color combo. Thanks for joining in the challenge at Classy Cards 'n Such. Beautiful card, and thanks so much on the information in your tutorial for making snow, will use this in my future Christmas cards. Oh my!!! One need to just sit and study you card it has so much depth and texture. Just beautiful!!! Thank you for playing along this week on Color My Heart. What a breathtakingly beautiful card! Thanks for joining us at Color My Heart Color Dare! Just perfect for a few dies I have, thanks VERY much. Everything you make is total eye candy Gracie! This is no exception – really stunning! Gracielle, this is a gorgeous card! I love that spray of berries and the red/black color palette! Thanks for sharing with us at Really Reasonable Ribbon! Your cards are always stunning, Gracie. Thanks so much for sharing your talents with us. I'm so grateful to have you play along.